Well, this is a first for me. 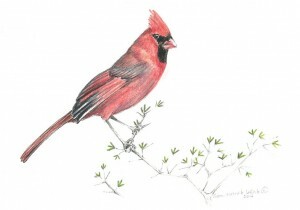 Today, outside my dining room window in the honeysuckle bush (more like a small tree), I saw the male cardinal who resides in our neighborhood. As he moved around the bush deciding on how and when to alight on the bird feeder, there appeared another male cardinal. Never have I ever seen more than one male cardinal in an area. The second male appeared to be molting his feathers as they were not as brillant or as uniformly red as the first bird. Neither cardinal appeared to be agressive toward the other. They both stayed in the bush for some time, each taking turns alighting on the feeder. I would hazard a guess that the second bird was perhaps the first cardinal’s fledgling from this year and as such was still being allowed to stay in the home territory. It was a special sight for me that I am glad I did not miss.